« Last Groom Standing — out now! Whatever you are celebrating this time of year, I hope it’s a merry and happy one! And here’s to a happy, joyful, healthy and abundant 2014! *This sweet baby is named Spice. I found his picture on the ASPCA website, and he made me smile. 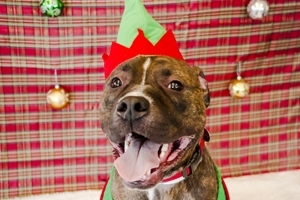 I hope he finds his forever home soon, as he looks like he’s ready for the holidays! If you want, you can contribute to the ASPCA here. This entry was posted on Friday, December 20th, 2013 at 8:14 am in News. You can feed this entry. You can leave a response, or trackback from your own site.